My New Humor Book is Available! Excited to announce that my third book is now available for public consumption! While my first two – 31 Days to Finding Your Blogging Mojo and Community Wins – were in the tribe-building / blogging space. This one? All humor. You will learn nothing at all, you will only laugh…I hope. Actually, Clams Are Miserable is a humorous exploration of the clichés and expressions Americans use every day without really thinking about what they’re saying. Some of the expressions poked fun of in this book include: “It’s raining cats and dogs”, “let’s bury the hatchet”, “she’s rolling in dough”, and 98 more. 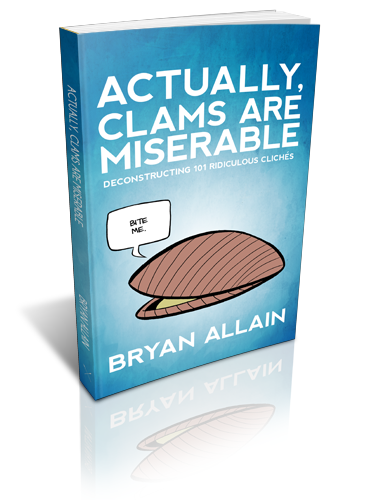 You can also pick up the kindle version on Amazon: Actually, Clams Are Miserable. Grab a copy today and get your laugh on! The book already has over 55 great reviews up on Amazon.com, and folks who received advanced copies are saying really nice things about it. “Community Wins by Bryan Allain is about as practical as it gets…I 6-Star recommend it. Amazon’s holding me down.” - Mike M.
Excited to announce my next eBook today! It’s my new eBook, Community Wins: 21 Thoughts on Building a Thriving Online Tribe, and if you’re doing anything that requires building a tribe of fans, followers, or friends, I think it’s going to he a huge help for you. I’m looking to give away free copies to the first 100 people who agree to write an Amazon review for the book, so hurry over to CommunityWins.net now if you want to get in on the deal. Can’t wait for you to read this!